First of all, you don’t have to break the bank to look trendy and feel comfortable. With summer right around the corner, I don’t know about you but I’m ready to slide into some new white sneakers! While Wall Street and most boardrooms may not be ready for sneakers yet, there are many industries and workplaces today where they are accepted — and when worn correctly, they not only look cool but they can also add a level of sophistication. It’s important to avoid the “Peter Pan Syndrome” though — when you reach 40+ you may not want to appear like you’re competing with your high school or college-age son. However, if you’re that guy who’s been rocking Chuck Taylors since college, then by all means stay true to yourself. 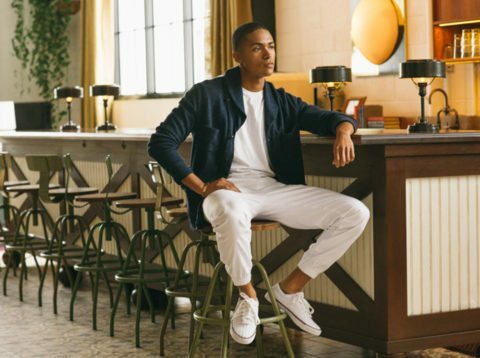 Below you will find some examples of affordable all white sneakers and ways that you can successfully (and with confidence!) incorporate them into your wardrobe. A navy or tan cotton poplin suit, paired with a classic 3-button polo or a long sleeve pastel-colored button down gingham check. A classic seersucker from Haspel in a light blue, tan, or gray is a fun summer option as well. A classic navy solid in lightweight hopsack wool or cotton poplin can give you many cool casual options. Wear red, green, white, pink, gray, or sky blue chinos. Choose a simple high-quality white tee, 3-button polo, or a festive multi stripe button down long sleeve shirt. Which sneakers are the best? I feel that those are a little more refined and sophisticated for a sneaker. To keep your canvas sneakers clean, I recommend following these steps. I have personally used both methods, and while both work well — I have always preferred to machine wash my canvas all-white sneakers.